Skywatcher Michael Jäger of Stixendorf, Austria, took this photo of the newfound comet McNaught C/2009 R1 on June 6, 2010, while the comet was visible in the northeastern morning sky. Full Story. 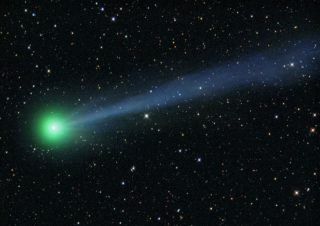 A recently discovered comet issurprising skywatchers by becoming brighter than predictions had firstsuggested and can now be seen with the unaided eye during the next fewweeks. Comet McNaught, officiallycatalogued as C/2009 R1, was discovered by Australian astronomer RobertMcNaught last September using the using the 0.5-meter Uppsala Schmidt telescopeand a CCD camera. It's the 51st comet that bears McNaught's name. Although initially an extremelyfaint object, enough observations of the newfound comet were made to allow BrianMarsden of the Smithsonian Astrophysical Observatory in Cambridge, Mass., tocalculate an orbit. Comet McNaught is expected to passclosest to the sun (perihelion) on July 2, at a distance of 37 million miles(60 million km). This sky map shows where to look in order to spot thecomet in the morning sky. The comet is visible now forpeople with dark skies away from urban and suburban lighting. By mid-June itmay be an easy skywatching target for most people. Comets brighten when the getnearer to the sun, because solar radiation boils icy particles and dust off thecomet's nucleus. A cloud of material called a head, or coma, and sometimes atail form. It's all illuminated by reflected sunlight. As comet McNaught approached the sun,amateur and professional astronomers worldwide watched with interest as itslowly increased in brightness. When April began, the comet wasestimated at magnitude +12. That's still about 250 times dimmer thanthe faintest star that one might see without any optical aid. But thecomet started brightening more rapidly in the days and weeks that followedand it's now bright enough to be glimpsed with the naked eye in a darkclear sky. The most recent"reliable" observation was made by Alexandre Amorim ofFlorianopolis,Brazil who saw the comet on June 6 using 10x50 binocularsand estimated the magnitude as +5.5. That's about as bright as thefaintest star in the bowl of the Little Dipper (on this scale, smaller numbersrepresent brighter objects). In the coming days, the comet isexpected to continueto brighten as it gets closer to the sun. If you want to get a view of thecomet, you'll have to get up early in the morning. Set your alarm clock for atleast two hours before sunrise. For most people that will mean around 3:30 a.m.local time. The comet is currently moving through the constellation ofPerseus, the Hero, which at that early hour will be low in the northeastpart of the sky. The comet will pass to the southof the second magnitude star, Mirfak around June 14. Both star andcomet will be about 20-degrees above the northeast horizon (10-degreesis roughly equal to the width of your clenched fist held at arm'slength; so the comet will be about "two fists" up from thehorizon). Don't expect anything spectacularjust yet, however. The comet should appear as a dimand diffuse, circular patch of light. Binoculars or a small telescopewill help to bring it out better; you might even make out a faint greenishcolor. From the head of the comet, anarrow tail of gas extends. John Bortle, a well known comet observer, likensMcNaught's appearance as resembling an "apple on a stick." "From the few rough magnitudeestimates I have seen posted, it would appear that the comet is perhaps a magnitudebrighter than had been anticipated, but whether this trend will continue is, asusual, anybody's guess," Bortle said. After June 15, Comet McNaught willrapidly slide lower toward the north-northeast horizon, passing very close tothe brilliant star Capella in the constellation Auriga around June 22 and a fewmornings later very near to the second magnitude star Menkalinan. By then, McNaught will be visible ?albeit with some difficulty ? both in the evening sky for a short while justafter sunset very low above the north-northwest horizon and in the morning skyjust before sunrise very low above the north-northeast horizon. Comets are very unpredictable, butsome astronomers say Comet McNaught might reach magnitude +2 by the end ofJune. If so, it won't rival the brighteststars in the sky, but it should be easy to spot and readily identifiable asa comet. SPACE.com will provide updates on thisnew comet as conditions change.